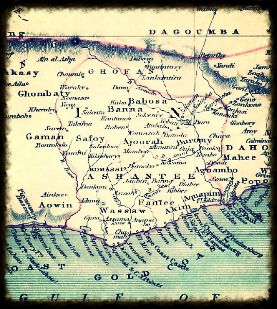 According to most Historians, the Akan group of people migrated from somewhere in the old Mali Empire, and their language was derived from a language very close to modern Arabic. After settling at a place near Kin-nta-mpo, where tribes like the Gonjas and some Mosshis where already present, most of these Akan groups migrated to places like Takyiman and Akurofuom. Some of the group that migrated to Akurofuom became the first Akan group to build houses, hence Adansifuo, it means housebuilders. From here various families started migrating with their families to seek a much better life. We know the members of the Oyoko family left at an early stage but there is no evidence of their first destination. All we know is Nana Antwiwaa Nyame, one of the descendant of the Oyoko family,claimed to have descended from the sky to settle in a place she later named Asiakwa (Yebe sii ha kwa - We descended and arrived here without our intension to stay) in the present Akyem Abuakwa area. Her desecendants are still the chiefs of Asiakwa. This explains why during the Asante and Akyem wars one Asiakwa chief refused to send his troops to fight against the Asantes because the King of Asante is his ancestral brother. Nana Antwiwaa Nyame might have for some unknown reasons, left Asiakwa leaving some of her offsprings there to take care of the place. She later claimed to have emerged with her family from a hole at the present Asantemanso, near Asumnnya in the Amansie District. The final settlement of the Oyoko family was some kilometres from Asantemanso in Kokofu. Nana Agyinammoa Mpatu who is known as the first Oyoko ruler is the direct descendant of Antwiwaa Nyame.After the death of Nana Twum and Nana Antwi their younger brother Nana Kobia Amanfi became the ruler of the Oyoko family. He found that their population was growing and farming and hunting,which was the main means of existance, was becoming difficult so he became worried and decided to explore other areas. As a result of his illness and eventual death he was unable to accomplish his task. His brother Nana Oti Akenten, son of Antwiwaa Nyame, who became the next ruler, once sent his senior hunter, Bofoo Nyame on an exploration trip, he came and discovered that a place which has already been settled by the Agona family called Kwaebrem,which later became Kwaabre, was very fertile and so he brought this good news to the chief,Nana Oti Akenten. Nana Oti Akenten and his family, as well as some of his subjects then moved to purchase part of the land from Agonaba Obaapanyin Adwoa Nkra Wiri and this settlement was later named Kumasi. This explains why the traditional jurisdiction of the present Tafohene(Agona Abusuahene of Asante) covers most of the lands within Kumasi. Tafohene and his people were the first settlers. 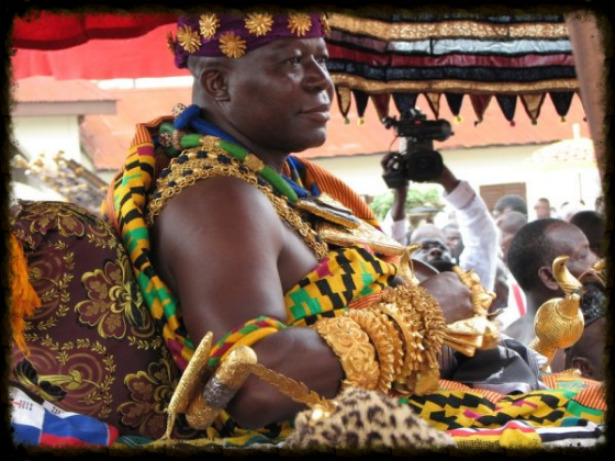 After the death of Nana Oti Akenten his maternal nephew, Nana Obiri Yeboa (Odi Ahenkan) became the chief of Kumasi. After his death his grandnephew Nana Osei Tutu l(Opemsuo), who was then in exile at Akwamfie,Akwamu Empire, became the next Kumasihene and after his friend Okomfo Agyei Frimpong, also known as the great Priest Anokye, helped him to form Asanteman, he became the first Asantehene. and his cousin Yaw Atwereboana. The main constitutional issue was wether an Asante Queen could forcibly impose her son on the throne without the acceptance of the king makers. 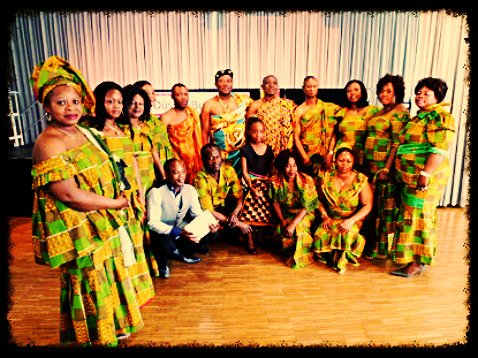 Yaw Atwereboana and his group sought the support of the British colonial administration, and in fact some of them moved into the British Colony of the Gold Coast to make their case, thus enraging all Asante. From then on, support for Agyeman Prempeh was strengthened, and the war over the succession ended in 1888). The British arrested him in 1896 after he refused to accept a monthly payment in exchange for British colonization. Nana Prempeh also refused to plunge his nation into another Anglo-Asante War, preferring to sacrifice his own, and his family*s independence to the greater Asante well being. He was held in Elmina for a while before being sent to Sierra Leone in late 1896. In 1901, he was sent to far-away Seychelles Island in the Indian Ocean off the coast of East Africa because Asantes were visiting him in droves in spite of the thousand mile journey. He returned to Kumasi on Wednesday, November 12, 1924. The British recognized him only as the Kumasihene (Chief of Kumasi), but of course, to all Asante he was, and remained the Asantehene. 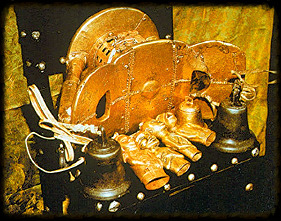 He ascended the Golden Stool on 26 April 1999. 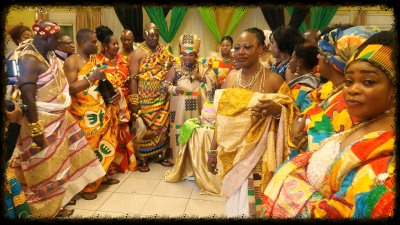 By name, he is in direct succession to the founder of the Empire of Ashanti, Otumfuo Osei Tutu I. Born on 6 May 1950, and named Barima Kwaku Dua, Otumfuo Osei Tutu II, he is the youngest of the five children of Nana Afua Kobi Serwaa Ampem, II, Asantehemaa (Queen mother of Asante). His father’s name is Nana Kwame Boakye-Dankwa from Kantinkyere in the Ashanti region and was also the Brehyia Chief” of Ashanti. He died on 1 January 2002, in Kumasi. His name at birth, Nana Kwaku Duah, happens to be the name of his paternal grandfather. His father, Nana Boakye also had other children from other marriages. Some of his other siblings are Yaw Boateng(Canada),Kwaku Duah(USA), Kwabena Agyei-Bohyen,Afua Sarpong and Ama Agyemang(Kumasi, Ashanti, Ghana) and the late Nana Kwasi Agyemang Prempeh. He was educated at Institute of Professional Studies(IPS) after his O-Level at Osei Kyeretwie College in Ghana and later at the Polytechnic of North London, now London Metropolitan University, from where he recently also received an honorary degree of Doctor of Philosophy, conferred at a ceremony at The Barbican Centre, London on 11 January 2006. Nana has six children.